Lunatic Studios announced today the release of version 2.0 of the popular WP Robot plugin for Wordpress weblogs. This release is the fourth free major update the company has released to its customers since the product was released 5 months ago. (...) This is exactly what WP Robot has become: The only plugin you will ever need if you want to automate your blog. Lunatic Studios launched a new version of its popular autoblogging plugin for Wordpress, WP Robot, today. WP Robot can help bloggers safe time and earn more advertising revenue off their weblog by aggregating content from several sources and posting it to the blog on autopilot in intervals specified by the user. New in version 2.0 of WP Robot is the ability to post content from Yahoo News as well as any RSS feed, pushing the total number of sources the plugin can gather content from to 9. Other sources for automatic content include popular e-commerce websites Amazon, Clickbank and eBay, from which users of WP Robot can also earn affiliate commission through their weblog. Other notable additions in version 2.0 include the possibility to cloak all outgoing affiliate links, the option to backdate posts to the past or schedule them for a future date as well as a powerful randomization engine. In addition the admin panel of WP Robot has been redesigned in order to improve usability and performance of the plugin. 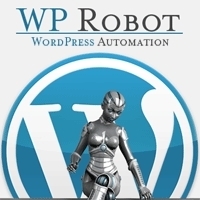 "We created WP Robot because we were not satisfied with the choices that were out there for Wordpress autoblogging at that time. ", said Thomas Hoefter, owner of WP Robot. "There was no All-in-One solution and so this is exactly what WP Robot has become: The only plugin you will ever need if you want to automate your blog." Through its autoposting features WP Robot can save bloggers much time for more important things while at the same time help them earn more from their weblog by utilizing several affiliate programs as additional revenue streams. A free demo version to try out the new WP Robot 2.0 is available on the official website, wprobot.net.